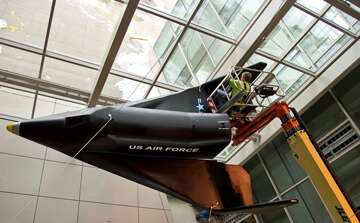 A replica of an early 1960s space plane that paved the way for future reusable spacecraft, including the U.S. space shuttle, is on permanent display in the atrium of Neil Armstrong Hall of Engineering. The replica hypersonic space plane, called the X-20 Dyna-Soar, was unveiled in October. It was a gift to the College of Engineering from Boeing Co., which developed it through a U.S. Air Force program to create a manned, military space plane. The X-20 program aimed to create a space plane that was also capable of atmospheric re-entry and that could be used for a variety of missions, including reconnaissance and strategic bombing. The space plane was designed for launch from a Titan II or Titan III rocket into a low-earth orbit of 150-300 miles. Its maximum speed was 17,500 mph. The Air Force had selected Armstrong, who later would become the first man to walk on the moon, as its first pilot-engineer. Additionally, a 1950 Purdue graduate, Henry Gordon, also was designated as one of the first text pilots. However, the X-20 program was canceled shortly after the space plane's manufacturing began, and the plane never saw flight. Despite that fact, the engineering advancements made while developing the X-20 directly influenced the space shuttle's creation, experts say. Before his death in 2012, Armstrong endorsed the display of the X-20 in the building named in his honor due to the space plane's place in engineering history and its unique appearance. Among those who attended the unveiling ceremony in October were Leah Jamieson, the John A. Edwardson Dean of the College of Engineering; Mark Burgess, Boeing's engineering operations and technology chief officer; and Darryl Davis, president of Phantom Works, a prototyping arm of Boeing. Burgess and Davis received bachelor's degrees in aeronautical and astronautical engineering from Purdue. During the unveiling ceremony, Davis told attendees that the gift also symbolizes the strong relationship between Boeing and Purdue. "I hope (the) X-20 Dyna-Soar mockup will stand as a reminder to you of Purdue's critical and ongoing role in science, engineering, space exploration and exploring new frontiers," Davis said.